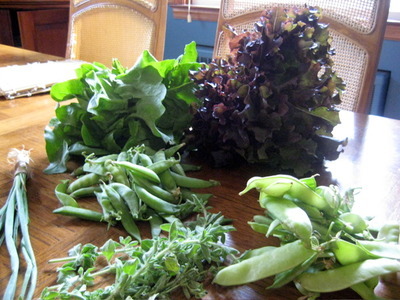 This week’s haul – green leaf lettuce and red leaf lettuce (1 head each), 1.5 pounds of snow peas (which Nik and I spent three hours picking), .8 pounds of sugar snap peas, oregano (which I picked while Nik was weeding raspberry bushes), and a tiny bunch of very cute baby scallions. Those aren’t even close to all the peas – I just put a few on there for effect. I have no idea what we’re going to do with all of those peas – probably freeze most of them. I have decided that I will never begrudge a farmer any amount of money that he wants me to pay him for vegetables. Four hours of working on a farm will do that to you!